Blog of Sudhir Mishra, A Bolangir based Journalist: Civil Society Dialogue on labour migration held at Bolangir:MOU with Andhra Pradresh and Telengana should be signed for betterment of Migrant workers. 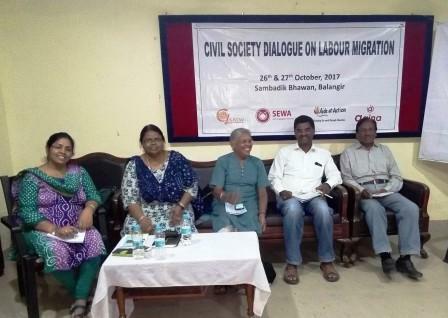 Civil Society Dialogue on labour migration held at Bolangir:MOU with Andhra Pradresh and Telengana should be signed for betterment of Migrant workers. Closely on the heel of Government taking stock of the progress made of its special package to check migration in 30GPs of Bolangir and Nuapada, now comes the reports of members of Civil society holding a dialogue on labour migration of Western Odisha on 26th and 27thOctober at Bolangir. Organized Jointly by GAATW,SEWA,Aaina, and Aide et Action Bhubneshwar, and attended by grassroots organizations working on migration and bonded labour in Bolangir, Bargarh, Nuapada,Kalhandi and Sonepur district, the meet deliberated on different aspect of Labour migration from these districts and how to streamline it by strengthening the existing mechanism like proper Implementation of MGNREGS, Inter-State Migrant Worksman Act of 1979,strengthing of vigilance committee at District level, proper and effective registration of migrants worker at Panchyat level, monitoring of skilled women workers working in outside state ,creation of corpus fund to deal away with problem of payment of MGNREG workers. The Memorandum of Understanding (MOU) signed with erstwhile Andhra Pradesh for betterment of migrants labourers while in Andhra Pradesh is defunct now. A new MOU with both Andhra Pradesh and Telengana state should be signed for better monitor ing of migrants workers there,opined UMi Daniel of Aide et Bhubneshwar. Daniel also opined for effective preparation and Implementation of Intensive participatory planning and providing the job as per the results of planning exercise to improve the condition of poor people and for success of MGNREGS. Among others Lalita Missal(NAWO)Nalini (SEWA)Sneha Mishra(AAINA) Saroj Barik of Aide et Action, Bhubneshwar, besides representatives from civil society organizations of Bolangir, Nuapada, Kalhandi, Bargarh attended and deliberated on this issue.